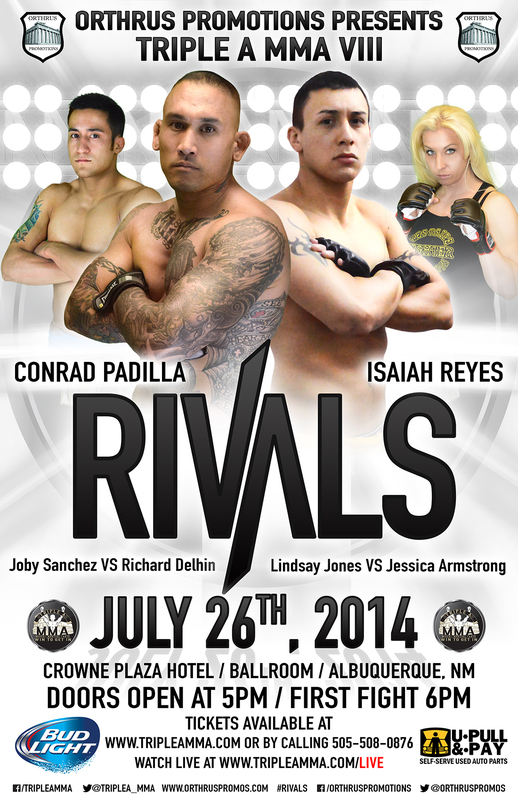 On July 26th undefeated flyweight Joby Sanchez will finally be making his Jackson’s MMA debut when he faces Richard Delfin on “Triple A MMA VIII: RIVALS’” co-main event at the Crowne Plaza Hotel on Saturday July 26th in Albuquerque, New Mexico. Sanchez (5-0) is among the best flyweights in the state of New Mexico and will look to extend his win-streak and finishing streak to six fights against the lesser experienced Richard Delfin (1-1) who hails out of Siege MMA in Phoenix, Arizona. The event will start at 6pm local time with the doors opening at 5pm. Tickets are now on sale at www.TripleAMMA.com or by calling 505-508-0876 and start at $25. In another fight added to the card earlier today, Westside Power Gym’s Lindsay Jones (0-0) willmake her professional MMA debut against El Paso’s Jessica Armstrong (0-3). Earlier this year Jones was featured in our Getting To Know segment this past March. *Tickets start at $25 for general admission, $35, $45 and $60 respectively for closer seats. Additional fees may apply. This is an ALL AGES EVENT.